I guess since I write a blog about southern food, it was high time that I posted a biscuit recipe. As a child, I vividly remember homemade biscuits on my grandmother’s table at almost every meal. She always had sorghum molasses on the table and my favorite way to eat her hot biscuits was to top them with a generous amount of butter and molasses. I regret that I never got her recipes for some of the classic southern food before she passed away. The biscuits in this post are very similar to hers, although I’m sure she used shortening instead of butter. Our good friends, Judy and Amy, came to Atlanta last weekend for a visit. We had a great weekend visiting, cooking, eating, drinking wine, and laughing. While they were here I had a hankering (now there’s a southern expression) for biscuits and sausage gravy. This hearty breakfast is a bit decadent, but was oh, so good! 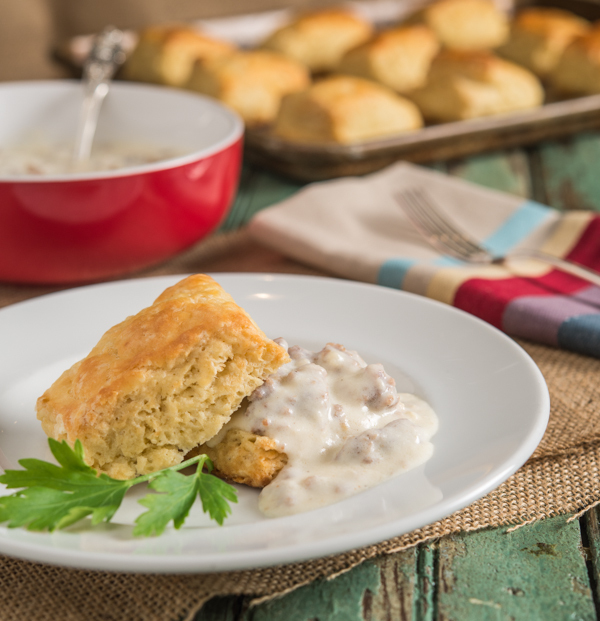 These biscuits probably shouldn’t be on your regular breakfast menu, but when you’re in the mood for a special treat, give this recipe a try. 3. Sift flour, baking powder, baking soda, salt, and sugar into a large bowl. 4. Place half the flour in the bowl of a food processor. Add butter and pulse until mixture looks like coarse crumbs. Some larger pieces of butter are fine. Pour flour/butter mixture into bowl with remaining flour mixture and mix well. 5. Pour buttermilk into flour mixture. Gently fold buttermilk into flour until dough comes together. Do not over mix. 6. Turn dough onto a floured surface and form an 8 inch by 8 inch square. With a sharp knife, cut dough into 2 inch square and place on baking sheet 2 inches apart. 7. Brush tops of biscuits with buttermilk and bake for 12 minutes or until to tops are golden brown. 1. Brown sausage in a large skillet over medium heat. Remove from skillet and set aside. 2. Melt butter in skillet. Add flour and whisk until well blended. Cook for one minute. 3. Slowly add milk and half and half, whisking to combine with flour and butter. 4. Continue cooking, whisking regularly, until gravy starts to thicken. 5. Add sausage, salt, and pepper. 6. Remove from heat and serve with biscuits immediately.